A group of about 60 protesters demanding solutions to Oakland's housing affordability crisis shut down an annual Chamber of Commerce business summit early Friday. The protesters, drawn from several community groups and banded together as the Oakland Alliance, disrupted the beginning of the meeting in the Kaiser Center's second-floor conference room. The opening of the summit was broken up by chants of "Housing is a right! Housing is a right!" and "Once I pay my rent, all my pay is spent!" One of the protest organizers, Carol Fife, told KQED's Tara Siler that the action was meant in part to put city leaders on notice they need to take gentrification and displacement as seriously as trying to attract new business to Oakland. Fife noted that Mayor Libby Schaaf, who was scheduled to attend Friday's summit, has been promoting the message that "Oakland is open for business." "We wanted to say Oakland will be open for business when Oakland is open for everyone," Fife said. In a statement, Schaaf's office said the mayor offered to meet with the protesters so the business summit could continue. The group declined the offer, the statement said, at which point Schaaf left. 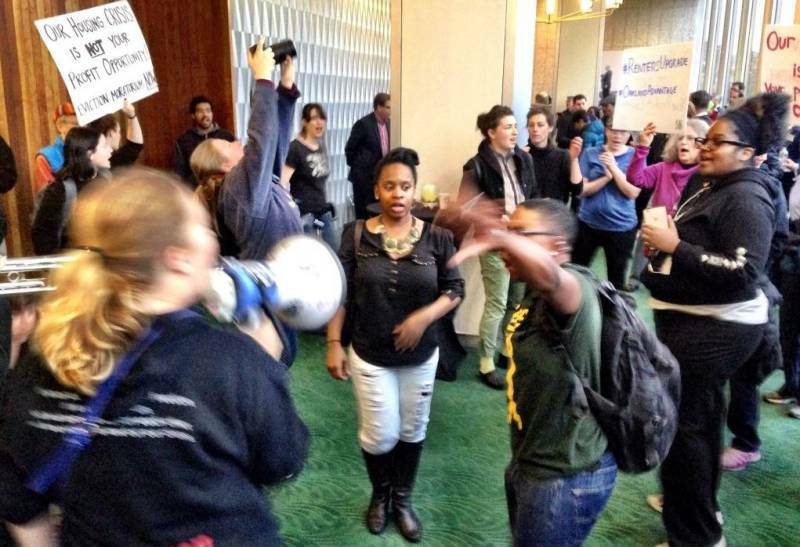 Today the Oakland Chamber of Commerce had no choice but to cancel its long-planned annual Economic Summit after it was disrupted by an action of activists protesting an unrelated topic. Local business, nonprofit and community leaders were eager to hear from speakers like Denis Ring, Founder of OCHO Chocolate who is committed to sustainable business manufacturing and creating jobs for West Oaklanders. Representatives from Goodwill Industries were also present and eager to engage in a dialogue about growing jobs in Oakland. Attendees were unable to hear about the work that the Chamber and business community are doing to ensure that our residents are prepared for college and careers right here. While the protestors chose to deny participants the opportunity to learn about some of the great work being done, The Chamber and its partners in the public and private sector will continue their efforts to build a thriving Oakland. One specific target of the protesters' anger was the City Council's tentative approval earlier this week of a 360-unit housing development on a city-owned parcel on East 12th Street. That development would contain 108 "affordable" units -- priced for those earning between 30 percent and 120 percent of the area's median income -- with the remainder of the project being comprised of market-rate units. Community activists have criticized the approved development as a luxury project that will accelerate displacement in the city. They have campaigned for a smaller-scale project that would contain all affordable units. In its statement, Mayor Schaaf's office pointed to a series of steps the city has taken, including relaxing requirements for approving in-law units, to ease the housing crisis. The statement also pointed to a plan Schaaf announced earlier this month to build 17,000 new housing units, including 5,600 affordable homes. The plan would preserve another 17,000 existing affordable units. The plan relies in part on city and county bond issues and in part on new housing impact fees for developers. Some influential voices in the city -- the East Bay Express, for instance -- have applauded the proposal but urged the mayor and City Council to move faster to address affordability . As city officials weigh Schaaf's plan, community groups have swung into action with a proposed ballot initiative that would cap rent increases and toughen the city's just-cause eviction ordinance.